The Ez-Pro Single Wall Mounted Dispenser is the ideal addition for creating ambiance in your environment. 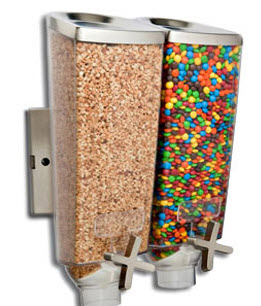 Fill this stylish dispenser with candies, coffee beans, toppings, and other dry food items. Place several together on your wall display to give your customers a wide selection to choose from. The paddle wheel mechanism serves 1 tablespoon portions with each turn. Portion control cuts down on waste saving you money. These cost effective containers generate curiosity and excitement. 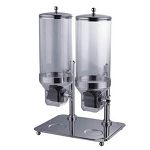 Showcase approximately 1 gallon of product in this stylish dispenser. Customers are going to be giddy with joy when they get to select their own favorites. 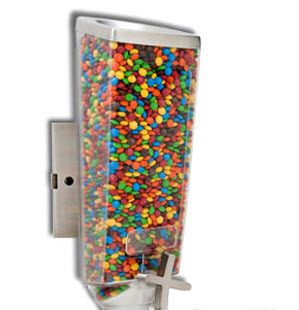 Order your wall mount dispenser today at All Candy Containers.